Office of the Commissioner of Customs (Preventive), Jamnagar has published Advertisement for below mentioned Posts 2017. Other details like age limit, educational qualification, selection process, application fee and how to apply are given below. the seagoing mechanized vessel on main and auxiliary machinery maintenance. Desirable:- Certificate of competency as "Engine Driver of a fishing vessel issued by Marine Mercantile Department." Selection Process: Written Examination and/or Skill Test as the case may be and also subject to Medical Fitness. How to Apply: The Application Form in the prescribed format on legal size paper along with relevant attested photocopies of educational qualification, proof of age, category, essential and desirable certificates etc. wherever necessary and three passport size photographs and two self addressed unstamped envelopes of 25 cms x 12 cms are to be sent to below address. The envelope should be superscribed with the words "Application for the post of Greaser". The Application forms complete in all respect must reach on or before 20-11-2017 by Ordinary Post/ Speed Post only. 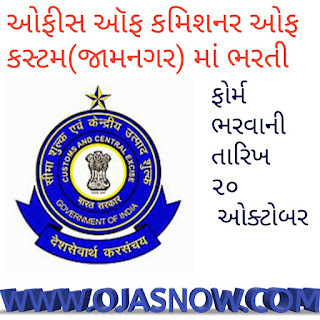 Address to sent Applications: The Joint Commissioner, Customs (Prev) Commissionerate, 'Sharda House', Bedi Bandar Road, Jamnagar - 361008 (Gujarat).